Out of fear of heavy casualties if they were bombed, Westminster’s and the rest of the country’s theatres and cinemas had been closed at the outbreak of war but by the middle of September, 1939 the Government had allowed them to re-open as long as performances were over by 10.00pm. This meant that the pre-war practice of theatrical performances starting at 8.30pm was abandoned and “Tonight at 6.30” became the norm well into the post-war period. 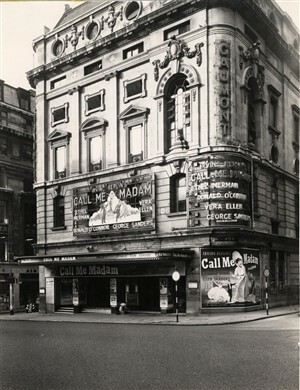 Cinemas, especially those in the West End, opened in the late morning with programmes usually over well before the 10.00pm deadline, meaning that picture and theatre-goers would be able to get home before public transport closed down for the night much earlier than it had in pre-war days. Four years later, although bleak, bomb-damaged and blacked-out, Westminster could still offer a great evening’s entertainment as, for example, a glance at the newspaper theatre and cinema listings for 19th September, 1943 reveals. Londoners, visitors and service personnel on leave flocked to see long-running comedies such as Noel Coward’s “Blithe Sprit”, at the Duchess and “Quiet Weekend” at Wyndham’s, the former “now in its third year” and the latter billed as “Wyndham’s Longest Run”. Just as today, Broadway successes such as “Junior Miss” at the Saville, “Watch on the Rhine” at the Aldwych, “Arsenic and Old Lace” at the Strand, now the Novello, and “Claudia” at the St Martin’s played to packed houses. On Shaftesbury Avenue, the Queen’s Theatre was closed due to heavy bomb damage and did not re-open until 1959 but at the nearby Apollo Terence Rattigan’s poignant “Flare Path” had settled into a two-year run. This told the often heart-rending story of the wives of bomber crews who lodged at a small hotel close to their husbands’ base and the “flare path” lit along its runway to guide them home after dangerous bombing missions. Sadly for Rattigan, the Broadway production closed after only fourteen performances in January of 1943, most likely because the New York audience, unlike its London sister, had little direct experience of living at such close quarters to operational warfare. Mounting any kind of theatrical production during the war years was a daunting aspect with air raids, the threat of air raids, theatre closures due to enemy action and shortages of all kinds. Scenery and, especially costumes were endlessly recycled but, on occasions, the Theatrical Industry Rationing of Clothes Committee, based in Charing Cross Road, would consider applications for extra clothing coupons. Film studios could also make a similar application through the British Film Producers’ Association in the Haymarket and, of course, cinema remained the entertainment option for most. On 19th September 1943, Westminster’s movie-goers could choose from an excellent selection of both British and Hollywood pictures. At the Rialto, Coventry Street, the British Technicolored but “controversial”, as it featured a “good” German, “Life and Death of Colonel Blimp” was playing and in terms of colour – always a huge selling point with wartime audiences eager for escape and glamour - there was Bing Crosby in “Dixie”, at the Plaza, Piccadilly Circus and Betty Grable, in “Coney Island” at the Odeon, Leicester Square. Again, in Technicolor there was Ernst Lubitsch’s sophisticated comedy “Heaven Can Wait” at the Gaumont, Haymarket and a Disney propaganda piece, “Victory Through Air Power” at the New Gallery, Regent Street. Of course, there weren’t many other European capitals where such recent American movies were showing in 1943 and the U.K remained Hollywood’s most important overseas market throughout the war years. One major difference between the pre-war theatre/cinema experience and that of most of the war years was the absence of ice cream, the manufacture of which was banned from 1942 until 1945, and the necessity of presenting precious “Personal Points” to back up the purchase of chocolates and other confectionery. With an average ration of only eight ounces per person per month for these, the rustle of chocolate or sweet wrappers would have been a rare occurrence in any theatre. On the other hand, unlike today, smoking was permitted throughout the auditorium! 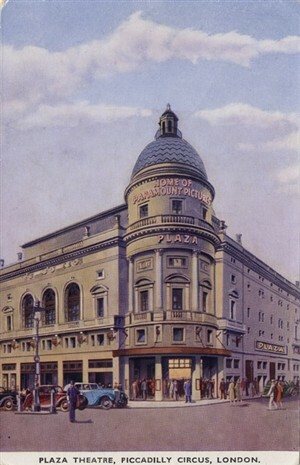 As a crowded theatre or cinema was one of the few places where, in the winter months, you could keep warm during the war years, any obscuring of the stage or screen by the fug tobacco smoke would have meant little to a Westminster audience eager for the splendid offerings in its many fairly austere, yet welcoming, wartime places of entertainment.